Great Looking New Listing! Mike lets set an appointment to see this ASAP. Pride of ownership show throughout this beautiful home. This home features an open and bright floorplan. Spacious living room with picture window, Formal dining area, Arizona room with security door that lead out to the covered patio. Charming kitchen with white cabinets and pantry. Large master bedroom with walk in closet, built in vanity & master bath with walk in shower. Inside laundry room with lots of storage space. Two car garage with additional golf cart parking. Enjoy the Arizona evenings and mornings in your beautiful landscaped backyard with fruit trees and covered patio. 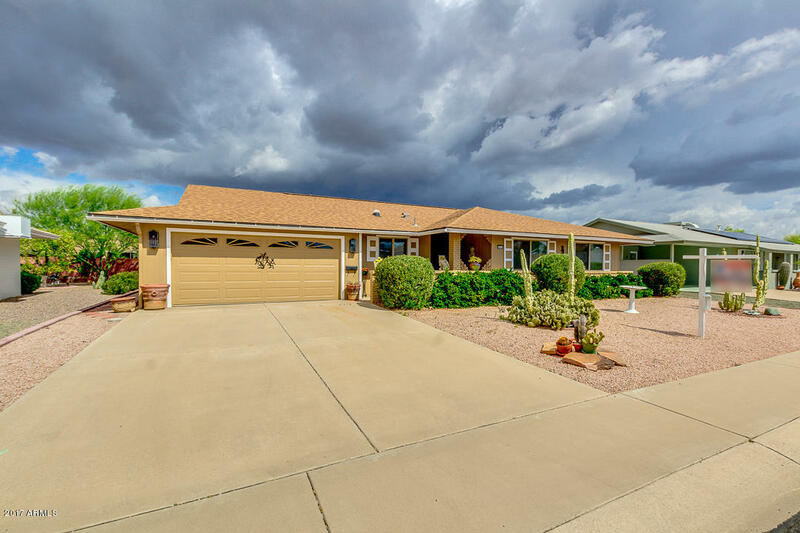 This home also features, custom paint, wood laminate flooring, freshly painted exterior, double pane windows, ceiling fans, newer roof, Storm/Security doors front and back. Don’t wait, come see this home today. 2 Bed 2 Baths 2 Car Garage!